The correction of unsightly scars is one of the most common surgical procedures of cosmetic plastic surgery. Scars are caused by accidents or injuries such as burns or after surgery. A scar treatment must always be carefully planned. Depending on size, location and appearance of the scar, the patient’s physician must decide on the appropriate therapy. In principle, the physician must distinguish between surgical (invasive) and non-surgical (conservative) measures. The procedure of polishing a scar is only useful when is estimated that the scar will not thicken again upon healing. 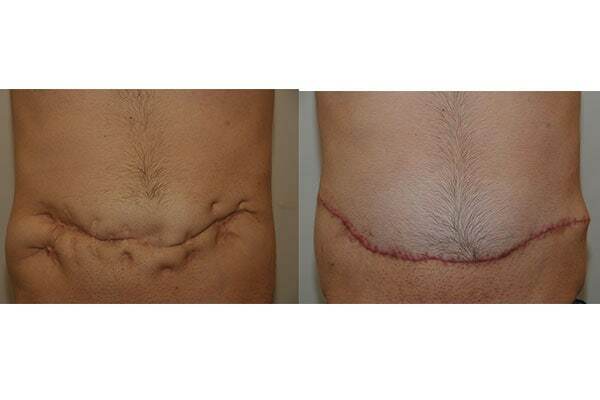 One of the most important aspects to consider in planning a surgical scar revision is the question of whether the scar runs parallel to the “gap lines” of the skin or breaks their lines. When one pushes the skin together, one recognizes immediately that the skin easily sets in parallel folds in one direction but not in other directions. To correct a scar that does not run parallel to the gap lines, in addition to their removal, a measure must be taken to change their course of direction so that they will be parallel after the operation or at least partially parallel in the direction of the gap lines. This is done using small flaps, usually known as Z-plasties. If the scar is too large to be easily removed, one can substitute the resulting skin defect with either a skin graft or work in a two-stage procedure with a skin expander. In the first step, an inflatable silicone balloon is inserted under the healthy skin in the immediate vicinity of the scar and filled slowly over several months. Thereafter, the scar is removed and the defect covered with the now stretched skin while removing the skin expander. Individual counseling, precise surgical planning, weighing the pros and cons of the respective operational procedures and not least experience in this field, lay the foundation for a good result. 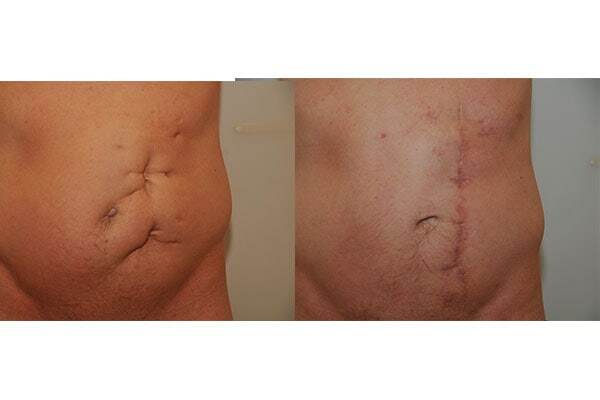 The result of a successful scar revision is long-lasting. 1. Which “scar types” are there? We distinguish between scars after mechanical injury, burns or after surgery. Injury scars may be very varied, burn scars are usually rather large and surgical scars are mostly straight. 2. Why are scars bothersome? Scars are seen mostly as a nuisance when they are visible (face, décolleté, extremities). The appearance of the scar also plays a role – is it thickened, sunken or broad; is it more disturbing than a delicate, pale and even level horizontal scar. If the scar is in a particularly unfortunate spot, for example longitudinally over a joint, it thickens over time and causes a restriction of movement (string formation). Scar tissue is very dense and inelastic, so burn scars are particularly annoying when they are located on moving body parts. 3. What possibilities are there for scar correction? There are conservative and surgical methods for scar correction. Conservative methods such as laser treatments or tattoos are no surgical interventions and only try to improve the visual appearance of the scar. Laser treatment can change the consistency and color of a scar, tattoos can match the color of the scar to the skin complexion, rendering it virtually invisible. Of course the possibilities of conservative therapies are clearly restricted. The surgical methods provide more complete correction options, ranging from simple excision (removal of the scar) to more complex flaps, if the scar is important. 4. Can an operation make a scar completely unrecognizable? No, unfortunately not. One can only try to make the scar as inconspicuous as possible. 5. Is there a predisposition to the formation of unsightly scars? Some people tend to form bead-shaped scars (hypertrophic scars, Keloids), in others wounds heal and form expanding sunken scars. Depending on genetic predisposition, the area of the wound may heal with excessive connective tissue or the opposite, so that the wound edges diverge. These individual types of wound healing can not be medically influenced, but there are preventive measures like silicone patches. 6. Does the age of the scar play a role? Generally surgical wounds heal more inconspicuously and more tenderly with age. This is connected with the reduced and slowed down cell division with age. 7. What must be considered in cosmetic operations, in order to obtain as beautiful and inconspicuous a scar as possible? The priority is a wound closure as tensionless as possible. With some operations a tension-free wound closure is impossible, so that gentle healing of the scars is rare. Examples would be most lifting procedures (abdominal skin, thigh, buttocks) and breast surgery (reduction, lift). Here, after one year there is almost always a scar correction necessary. 8. When can scars be corrected? Scar corrections should not be carried before a year. The appearance of a scar may change over a long period; it is called “fresh” and “mature” scars. The older the scar, the greater the likelihood of a successful correction. 9. What are the results? Depending on location, size & type of scar, the potential magnitude of improvement varies considerably. Smaller scars on the face or operational scars can usually be improved. The biggest challenge, however, are burn scars because they are usually very large. In general, the results of a scar correction are quite satisfactory. 10. Is scar revision performed under local or general anesthesia? In the overwhelming number of cases, scar correction can be performed under local anesthesia. Complex procedures however will need a general anesthesia. 11. What complications can occur? The possible risks of scar correction are similar to those of most smaller aesthetic surgeries. One differentiates complications concerned between medical interventions and the aesthetic result. Among the medical risks are infection and bleeding, but both are extremely rare with correct performance. Aesthetic complications concern unsatisfactory results, such as the scar isn’t smaller and less conspicuous afterwards. EUR 850 – 3.500, – depending on duration of operation, number of nights, room type (suite, single, triple) and hospital. In general, the procedure is performed under local anesthesia with no additional costs. If the surgery is performed under general anesthesia, an anesthesiologist is needed for surgery. The cost of anesthesia varies depending on the duration of the operation and is between EUR 200 – 800. An average cost of EUR 400-500 is to be expected. 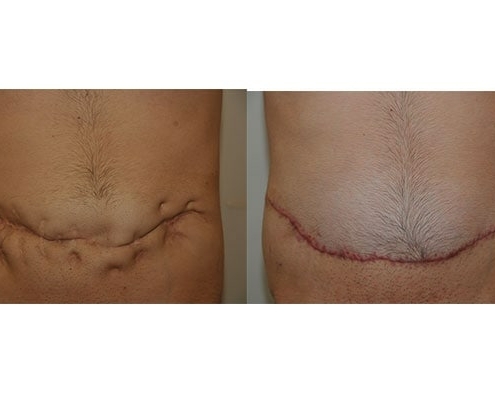 Depending on the size of the scar revision, there is a surgical fee of between EUR 350-4.500. An average scar correction comes to EUR 700-1.000. Aspirin, Thromboass and similar anticoagulantsshould not be taken 14 days before the procedure. If necessary, a conversion to Heparin can take place. If the procedure takes place in a treatment room of my private clinic, please come to us about 30 minutes ahead of schedule. Discharge from the hospital usually happens on the day of the surgery. If the procedure takes place in a treatment room of my private clinic, discharge usually happens after 30-60 minutes. Please do not drive yourself. Take a taxi or let yourself be picked up.